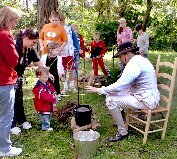 Pottstown, PA (August 29, 2012) – On Friday, October 5, from 10:00am to 2:00 pm, bring homeschoolers out to historic Pottsgrove Manor for a fun-filled and educational field trip that will let them explore the skills, trades, and pastimes of the 18th century. This program is ideal for elementary-aged students and is open to individual homeschool families, homeschool groups, and small school and church groups. The cost is $5 per child. Call 610-326-4014 to pre-register or for more information. Activities will be ongoing throughout the day; allow at least two hours for the visit. As most activities will be outdoors, this program will be held weather-permitting. 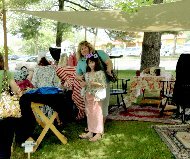 Limited parking and handicapped spots are available in the Pottsgrove Manor parking lot. Visitors may also park directly across on King Street in the Quality Inn parking lot. Pottsgrove Manor, home of John Potts, colonial ironmaster and founder of Pottstown, is located at 100 West King Street near the intersection of King Street and Route 100, just off Route 422, in Pottstown, Pennsylvania. Pottsgrove Manor is operated by Montgomery County under the direction of the Parks and Heritage Services Division of the Assets and Infrastructure Department. Regular museum hours are Tuesday to Saturday, 10:00am to 4:00 pm and Sunday, 1:00pm to 4:00pm. Tours are given on the hour. The last tour of the day begins at 3:00pm. Groups of 10 or more should pre-register by calling 610-326-4014. 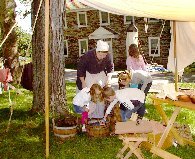 For more information and a full calendar of events, visit the website at http://historicsites.montcopa.org/pottsgrovemanor.